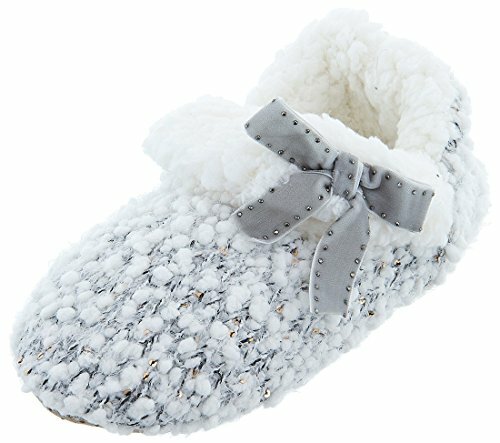 FASHIONABLE: Finally, beautiful styling in a slipper that has comfort and warmth built in with a lovely plush collar and lining. COZY COMFORT: With a soft, faux fur or plush collar and lining, combined with a cushioned, foam footbed, your feet will be cradled in comfort. BEAUTIFUL MATERIALS: Made with a soft, "popcorn knit" material with depth and tiny sequins for that little bit of sparkle. The velour bow is a lovely detail, with a rhinestone border. Look beautiful, feel beautiful.